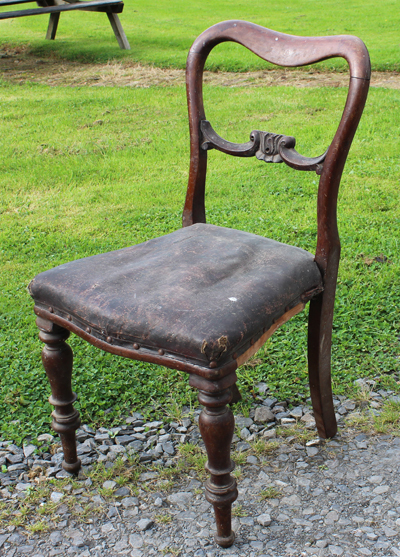 A new arrival in the workshop – a Hepplewhite Louis XV style side chair – a rare treasure found in an antique sale. 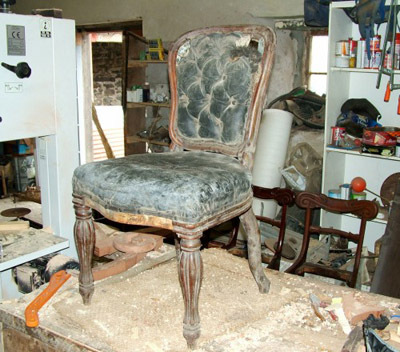 Made from Cuban Mahogany which had mostly disappeared by the 1760s; unfortunately the diagnostic feature of Cuban mahogany, apart from its rich colour, is that it’s very brittle – quite a lot of damage to be repaired and missing parts to be made before the upholstery can be started. – probably belongs in a museum. 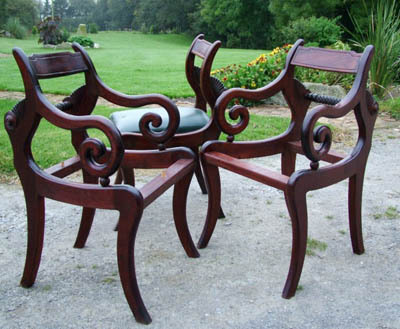 I made the pair of Regency style carvers in the foreground to complete a set of dining chairs of which the one at the back is a member. The strikingly unusual design using opposed sabre legs has its origins in the classical Greek Klismos chair. The loose seats might have been cane-work originally. The material is Sapele or African Mahogany quite good for the purpose but nowhere near as good as the original Spanish Caribbean Mahogany. 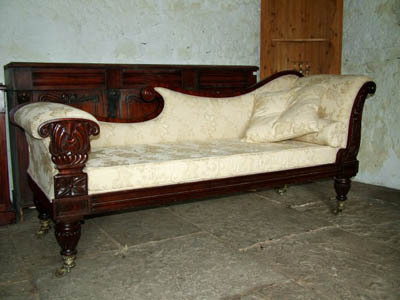 This is a Regency period daybed we restored – slightly different from a chaise-longue but equally intended for posing upon. The ornate brass castors and the elaborately carved Mahogany show-wood are very typical of the Regency – William IV period. 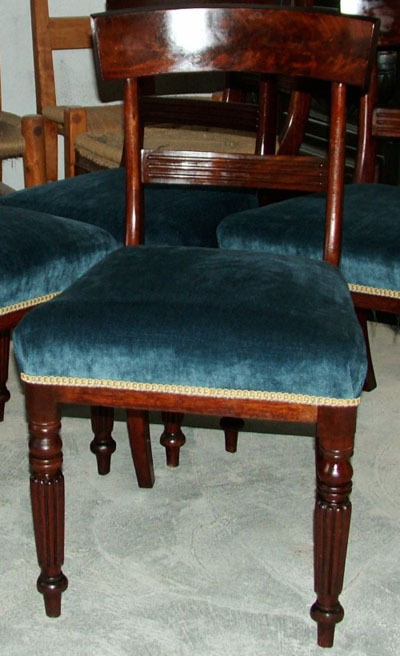 This is one of a set of Mahogany Regency dining chairs we restored recently. The client chose the blue velvet fabric and obviously the overall effect is of understated elegance. 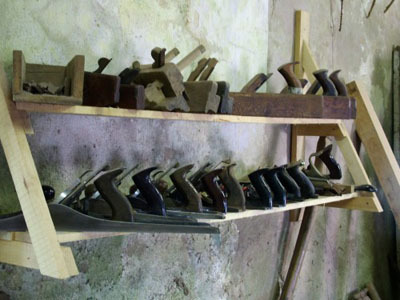 This is a couple of dining carvers from the early 1800s – they don’t match but they have a certain family resemblance. 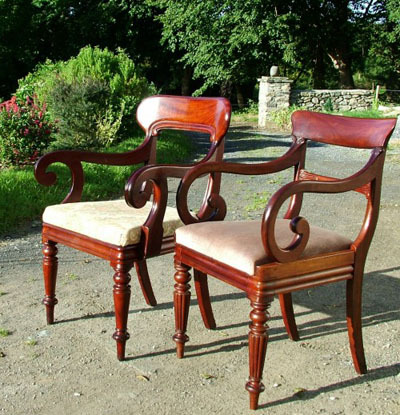 We removed the grime and muck that gets into the finish, applied linseed oil and French polish, re-glued and strengthened them and finally, re-upholstered. Another transformation from nondescript to stunningly handsome, elegant heirloom pieces. 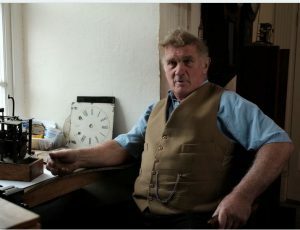 We do our work the slow way and we might not have as many planes as Michael O’Leary but they don’t make as much noise as his.